by Ruth C. Duck. Westminster John Knox Press, 2013. How should worship feel and look? Quiet and reverent or loud and participatory? Hymns or contemporary music? 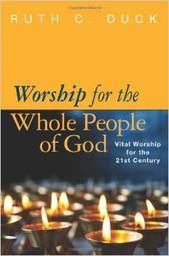 Professor of Worship Ruth Duck has many ideas, and her comprehensive work addresses virtually every aspect of worship. Yet she is not prescriptive; her work is an attempt to help congregations and pastors learn about worship and thus create vital congregational worship. After her theology of worship, Duck explores how different cultures worship, including African-American, Latino, and white. She helps planners “read” a congregation and lead appropriate and culturally diverse worship. Other topics include the role of music and art in worship, the sacraments or ordinances, preaching and prayer, and the liturgical calendar. Duck also explores less frequent types of worship, such as funerals, weddings, and reconciliation and healing. Christians from all traditions will appreciate Duck’s scholarship and her practicality, as evidenced by the four appendices, one of which is a tool for planning worship. Please Sign In to submit your feedback. Funded by Lilly Endowment Inc.